BOCA RATON, Fla. – A reality check hit Boca Raton resident Michael Ross with a bang. “I jumped in, started the car, put it in drive, got about halfway down the driveway, and I looked inside the console and noticed that there was a missing weapon,” said Ross, who realized in that moment he forgot to lock his car overnight. Boca Raton resident, Michael Ross, says he was about halfway down his driveway when he realized burglars broke into his car and stole his gun. “You feel violated! It’s terrible to know that someone was inside my vehicle rummaging around, taking things that don’t belong to them,” Ross told Contact 5. It turns out, Ross is not alone. Contact 5 asked for theft reports from some of the largest agencies in our region. Records show more than 650 guns were reported stolen from unlocked cars in the most populated areas in Palm Beach County and the Treasure Coast, since 2017. Sure, most people know to lock their car doors, but reports show often people simply forget. “You know, we get that a lot where people say they forgot to lock it,” said Boynton Beach Police Officer Denise Schrecengost. “But it’s a little too late after you have done that and they have taken your gun from your vehicle." 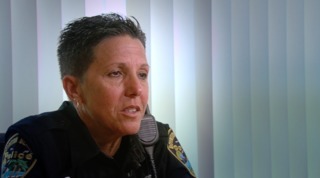 Officer Denise Schrecengost with the Boynton Beach Police Dept. wants to hold gun owners accountable for leaving their guns unsecured in an unlocked car. In the major cities Contact 5 reviewed, only Boynton Beach has had more guns stolen out of vehicles so far in 2018, than all of 2017 combined. According to the top cop in Palm Beach County, State Attorney Dave Aronberg, there is no law in Florida which holds a gun owner accountable if they leave a firearm unsecured in a car, and it is later stolen. “It’s up to the legislature to make the laws of the state,” Aronberg told Contact 5, when asked if he would support a law which would hold gun owners accountable. “But we have seen an uptick in the number of instances where a gun was stolen out of a car, locked or unlocked. According to statistics from the Florida Dept. of Law Enforcement, more than $900,000 worth of guns were stolen in Palm Beach County and the Treasure Coast last year. 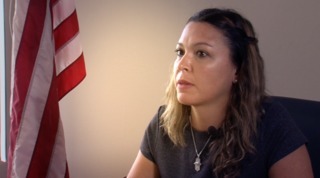 Rep. Emily Slosberg (D-Boca Raton) says she would consider putting something on the books to hold gun owners accountable for leaving a firearm unsecured in an unlocked car. Slosberg represents part of southern Palm Beach County. Contact 5 found, since 2017, more than 180 guns have been stolen collectively out of Boca Raton, Boynton Beach and Delray Beach. “I would consider putting something on the books, specifically, possibly a civil remedy,” said Slosberg. Others argue gun owners should not be victimized twice. 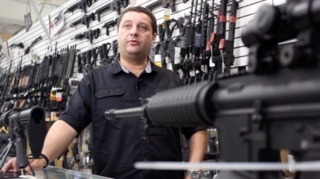 Alex Shkop, owner of Guns & Range Training Center in West Palm Beach, does not want gun owners to be victimized twice. Shkop thinks a law could discourage gun owners from reporting their guns were stolen in the first place. “I think as a nation we kind of have that need that somebody needs to punished,” he explained to Contact 5 Investigator Merris Badcock. “The whole idea of the concept might be wrong: How can we punish versus how can we educate? “If we are going to put laws on the books, I would rather see a law saying you have to take a concealed course (or course like a concealed course)…before you can purchase a firearm, or at least your first firearm,” Shkop said. Use the map below to see how many guns were stolen out of unlocked cars in your area. If the map does not load, click this link.